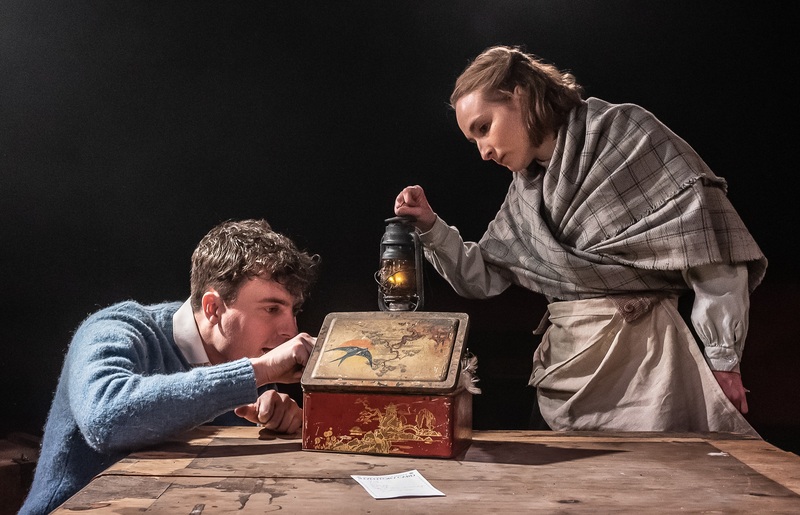 Before it starts, King’s Head Artistic Director, Adam Spreadbury-Maher explains that this is the first revival of Outlying Islands since its run at the Royal Court, but even if he hadn’t said that, you’d know it was a Royal Court production. Everything about it screams RC – the picturesque landscape, the challenging of societal norms, an eerie presence of something unseen. But don’t let it put you off, there are some stellar performances and a stunning soundscape from Atticist. Set during the prelude to the Second World War, two ornithologists (Jack McMillan and Tom Machell) have been sent by the Government to an island in the outer Hebrides under the guise of conducting a bird population survey. It may be August but, as everyone who spends their summer at the Fringe knows, the weather hasn’t got the message. Add to that the sexual frustration, sharing very small living quarters with native Ellen (Rose Wardlaw), and a surprising amount of whiskey* and you’ll start to get a picture of the tension that’s whipped up in what on the surface looks like a nice story about fowl enthusiasts. Wardlaw is outstanding in her role. Oppressed by the patriarchal rule of her family, she fills an impossibly small space on the stage at the beginning. And then these beautiful soliloquies tumble out of her as she gets to explore being her own person. From being objectified to ruling the roost, Wardlaw captivates her audience. But it’s Christopher Preece’s sound design that makes Outlying Islands particularly special. From the cacophonous fork-tailed petrels in a frenzy, to the music that accompanies Ellen’s powerful monologues ,you are guided through the story by Preece. The King’s Head is famously a warm theatre, but the whistling winds have me sat with my coat over knees. There are so many of these little touches, like the Scots poetry that begins and ends the first act, that create a holistic experience for the audience. The ending nose dives somewhat, though. The questioning of sexual identity, and the desire to go against conventional society that’s expressed in the dark room, feels like the natural climax – this is where this play has been heading for the last two hours. And then all of a sudden the boat arrives and it’s the end. Did we miss a scene? Everything is wrapped up far too neatly for a production that exists in form and plot outside of our normal expectations of theatre. *The only food they appear to have packed is ginger nuts but there’s an endless supply of whiskey – these people have got their priorities right. Outlying Islands runs through 2 February.